Newly appointed U.S. officials prepare for their first consultation with tribal elders and influential Islamic clergy in Khost, Afghanistan, September 19, 2006. No matter how moral, professional, and correct she might be, an American female officer assigned such duties would have to overcome certain negative assumptions in foreign eyes. The female advisor may be able to overcome these cultural inhibitions, but it will be a difficult, uphill battle, consuming inordinate time and energy and possibly detracting from the advisory mission. U.S. Navy photo. The American advisor must take care not to let himself be regarded as just another person who has come to pass out gifts in order to curry favor. He must not be regarded as simply a source of material assistance, supplies, high tech presents, and trips abroad under the rubric of training. In resource-strapped Afghanistan, for example, local and even senior officials became accustomed to requesting telephones, office furniture, office supplies, security accessories, equipment of all sorts, vehicles, and a wide variety of other items from Provincial Reconstruction Team (PRT) commanders, American officials, and other foreign visitors and donors. On many occasions, the Afghans would request the same items from multiple sources. The advisor must look at himself through local eyes and the local culture. If the American officer's "can do" attitude is too highly developed, he may just seem ill-mannered and abrasive to the official and his staff, who often operate at a different tempo than that in U.S. military circles. If he appears to be too young and lacking in authority, the American may be regarded simply as a decorative foreign staff aide who tags along to add luster to the official's entourage. Age is important in many parts of the traditional Islamic world. For example, the term "white beard" is commonly used in Afghanistan as a term of respect, implying that only someone who has grown old has experience and expertise. Tribal and village elders are the source of advice and authority, not the younger generation, and young men attending a major meeting or assembly are expected to sit silently and listen to the older generation. The senior foreign official and the American advisor may have very different concepts of the time necessary to complete an action. Some cultures do not place value on undue haste, and the smart advisor soon learns that "bukra" or "fardo" ("tomorrow" in Arabic and Farsi) or "inshallah" ("God willing" in Farsi/Dari/Turkish and Arabic) often mean that action has been relegated to some other time and place, but probably not any time soon or any place near. An American officer assigned as an advisor normally knows how long his tour of duty will be. From the day that he arrives in-country, he hears a clock ticking off the days left in his assignment, and he may feel a subconscious compulsion to complete a check list of "things to do" in order to satisfy performance goals. His starting point for action is the date of his arrival at post. The U.S. government's fiscal year, his own evaluation report and upcoming meetings, official visits, American holidays, and the normal needs of his family in the United States can all be markers that affect his timing. Looking at his new environment, the advisor may feel that action is vital and should be immediate. The foreign official, on the other hand, has a different view of time and a different perspective. His focus is indefinite, and he will not be rated on one year's performance. He has been a player in the long process that brought local conditions to their present state and assumes that he will be in power for a long time to come, so he generally will not share the American's sense of urgency. He probably does not share the Puritan work ethic either, and will see little reason to change his habits or his work environment in order to fit a foreigner's conception of what is appropriate. And the official has probably seen a large number of foreign advisors come and go, their names long since forgotten, and their presence leaving only minor or no impact on local conditions. A young male captain or major may be the best soldier in the world and a great teacher. A female of any high rank may be a paragon of military ability and experience. In foreign eyes, however, they face great initial obstacles, and have a serious disadvantage compared to an older male officer of colonel to general officer rank. Ethnic background, skin color, and religious faith also play a role, based on local society and tradition. The result may translate into what Americans consider prejudice and discrimination. A good advisor will set a personal example of fairness, but cannot impose his standards on his foreign counterparts. It is difficult to know by what standards a foreign leader will judge an American. In an introductory conversation with a major and much feared Pashtun warlord in Afghanistan, an American diplomat began by listing the war zones and hardship assignments he had had, tying his life abroad to what hostilities were taking place at the time. But the warlord was oblivious to other countries' conflicts. Then the diplomat noted that over the course of his life he had been held by security officials in the United States and two foreign countries, eventually spending well over a year in prison abroad. The warlord's single question was about the incident in America, and when told it involved a death, said simply, "then I can talk to you." ... Even informal social settings can be a minefield for the unwary, and what is normal and ordinary in the United States might be considered rude, embarrassing, and very detrimental to the advisor's mission. For example, concepts of personal space are different in many Muslim countries, and the American may find himself far too close physically to other men to be comfortable, with guests leaning against him while everyone is eating or simply sitting down to talk. It is not unusual for Muslim men to walk hand in hand, or to hold hands far longer than a quick American handshake would allow. In the United States, men and women will shake hands or possibly even kiss cheeks on first meeting, an act that would be inconceivable by conservative Islamic norms. For example, blowing one's nose in public is regarded as repulsive in Iran and Afghanistan, as much a turn-off as picking one's nose in public would be in the United States. 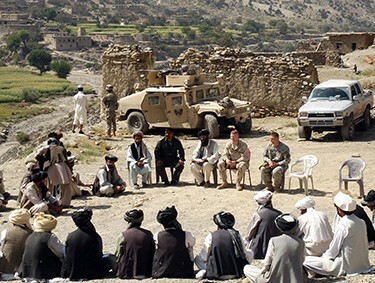 On a trip in a remote part of Afghanistan's Ghor Province, a PRT commander and his political advisor stopped at a small roadside teahouse to talk to the villagers gathered there. The commander, who really did not want to drink anything, politely turned down the offered tea. Turning to the local villagers, the teahouse owner said in Dari, "These foreigners think what we eat and drink is dirty." If the POLAD [political advisor] had not understood the comment and quietly told the commander to accept the tea, the atmosphere would have turned very cold very quickly. Sometimes hospitality can be carried to extremes. At a Pashtun banquet in northern Pakistan when an American diplomat was guest of honor of a large group of clergy at a refugee camp, a whole roast sheep was carried in on a tray. The bearded host reached his hand under the sheep's tail and pulled out a large wad of semi-raw fat, holding it up to the American official's mouth and saying, "Eat. It's the best part." Swallowing the suet directly from his host's hand with a nod of thanks was the only way to continue the momentum of the conversation. Sources of national income at all levels may have little relationship to what the Budget Office has in its ledgers. Is the salary structure set by regulation, or is it based on fees for service, on the order of American waiters and waitresses who receive only a token salary from the restaurant owner and make their real income in tips from customers? Is taking a gift or bribe the normal state of affairs? How large can bribes be and still be acceptable, or is it full no-holds-barred in the bribery arena? Is there a well-understood and expected "payment for service" that satisfies both officials and the public—say 10 to 40 percent over and above the published fee—and on which government bureaucrats rely to supplement meager official salaries? Is it really corruption for a low-level worker, policeman, or soldier to ask for a few dollars as a gift when he would otherwise not have enough income to feed his family? Do workers in the agency have to pay off more senior officers in order to get a job? Is acquiring an office a one-time purchase, or a percentage of the official's salary every month to those higher up the chain? Does anyone in the hierarchy actually receive a living wage, or are they all expected to supplement their incomes by demanding additional money from people who need their service (e.g., contractors or supplicants) or from people who want to get promoted or get better assignments within the official's agency? In much of the developing world, the Western concept of "conflict of interest" is incomprehensible. Senior officials do not place their assets into a blind trust when they assume office. Rather, many assume office in order to get rich, and paying for office can be a normal procedure at all levels of the bureaucracy, just as enriching their families and friends through their office can be regarded as normal behavior. Accessible as a free download from the Strategic Studies Institute of the U.S. Army War College, at http://www.strategicstudiesinstitute.army.mil/Pubs/display.cfm?pubID=869.